'Full House' Star Andrea Barber aka Kimmy Gibbler: Where Is She Now? 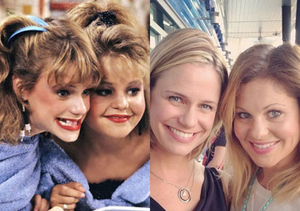 Andrea Barber was everybody’s favorite onscreen BFF in the ‘80s and ‘90s as DJ Tanner’s best friend on “Full House” (1987 to 1995). Where is she now? Andrea is a stay-at-home mom with two kids! After “Full House” ended, Barber went on to earn an Bachelor’s in English from Whittier College and a Masters in Women’s Studies from the University of York in England. She later returned to Whittier as an assistant to the Director of International Programs. Andrea, who is still good friends with “Full House” co-star Candace Cameron Bure, married Jeremy Rytky in 2002. They are the proud parents of Tate, 10, and Felicity, 7. Barber has popped up in the media from time to time. She made a Funny or Die video with Dave Coulier in 2012 and attended his wedding in Montanta in July 2014. Check out the pics! Andrea is also named as one of the castmates onboard for the rumored “Full House” revival!